Elaine Safee Braddy has a birthday today. 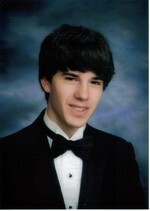 This is my son's senior picture -- it was taken back in April when he was still a junior. Time has flown by from when we were this age! !